As a premier NMR facility, NMRFAM seeks to maximize the efficiency and convenience of NMR data collection while minimizing cost and complications for the user. As such, research and technology development for automated data collection methods are ongoing at NMRFAM, with two software packages described below. ADAPT-NMR (Assignment-directed Data collection Algorithm utilizing a Probabilistic Toolkit in NMR) is a fully automated method for integration of protein NMR data collection, chemical shift assignment, and secondary structure determination. ADAPT-NMR optimizes a fast data collection path involving multiple reduced dimensionality experiments so as to most efficiently realize complete resonance assignment and secondary structure determination of a protein while spectra are being collected on-the-fly. With the sample in the NMR probe, ADAPT-NMR directs the NMR spectrometer to collect the optimal 2D plane of the most favorable experiment and then analyzes the resulting spectra to determine the positions of the peaks and to update the spins systems, chemical shift assignment, and the secondary structure of the protein. The procedure continues until the collected data support comprehensive peak identification, chemical shift assignments at the desired level of completeness, and protein secondary structure determination. 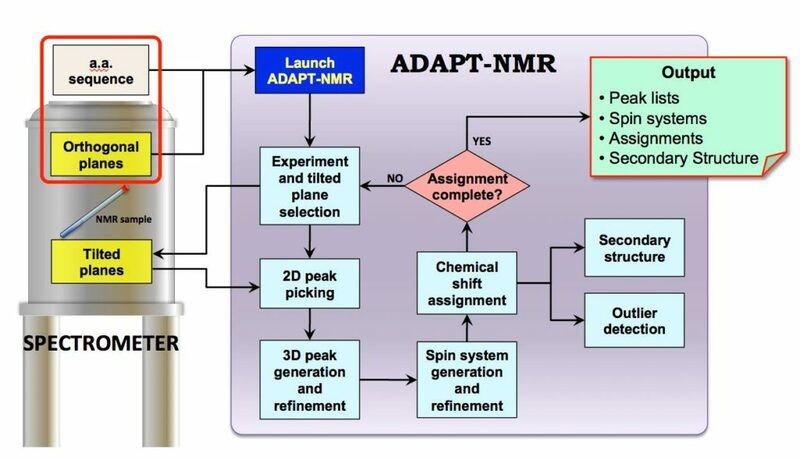 To facilitate the high-throughput acquisition of NMR experimental data on large sets of samples (such as for metabolites, ligand screenings or natural products research), we have developed NMRbot, a simple and straightforward automated methodology that capitalizes on recent advances in Bruker BioSpin NMR spectrometer hardware and software. Given the daunting challenge for non-NMR experts to collect quality spectra, our goal was to increase user accessibility, provide customized functionality, and improve the consistency and reliability of resultant data. NMRbot, is encoded in a set of scripts written in the Python programming language accessible within the Bruker BioSpin TopSpinTM software. NMRbot improves automated data acquisition and offers novel tools for use in optimizing experimental parameters on the fly. This automated procedure has been successfully implemented for investigations in metabolomics, small-molecule library profiling, and protein-ligand titrations on four Bruker BioSpin NMR spectrometers at the NMRFAM. The investigators reported benefits from ease of setup, improved spectral quality, convenient customizations, and overall time savings.